ESG recently surveyed 356 IT professionals responsible for evaluating, purchasing, and managing data storage technologies within the mid-market and enterprise organizations in North America. The research firm asked a series of questions to get insights into the growth and acceptance of solid-state storage, including new technologies like NVMe. 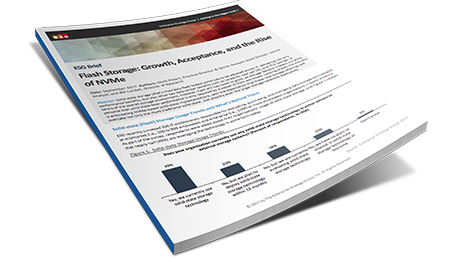 Read the report to see where the industry is heading, the key drivers for deployment, and benefits realized from solid-state storage. 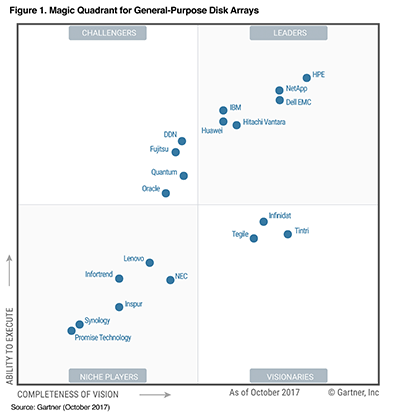 Gartner Magic Quadrant for General-Purpose Disk Arrays, Stanley Zaffos, Roger W. Cox, Valdis Filks, Santhosh Rao, 31 October, 2017. This graphic was published by Gartner, Inc. as a part of a larger research document and should be evaluated in the context of the entire document. The Gartner document is available upon request from Tegile Systems. Gartner does not endorse any vendor, product, or service depicted in its research publications, and does not advise technology users to select only those vendors with the highest ratings or other designation. Gartner research publications consist of the opinions of Gartner’s research organization and should not be construed as statements of fact. Gartner disclaims all warranties, expressed or implied, with respect to this research, including and warranties of merchantability or fitness for a particular purpose.